Two former computer programmers for Bernard Madoff's investment firm were arrested Friday on charges they helped in fraud for more than 15 years. The U.S. attorney's office said Jerome O'Hara, of Malverne, N.Y., and George Perez, of East Brunswick, N.J., were arrested at their homes. It said the pair formerly worked for Bernard L. Madoff Investment Securities. According to an SEC complaint filed in U.S. District Court in Manhattan, O'Hara and Perez wrote programs that generated thousands of pages of fake trade blotters, stock records "and other phantom books and records to substantiate nonexistent trading." O'Hara and Perez "had a crisis of conscience in 2006 and tried to cover their tracks by attempting to delete approximately 218 of the 225 special programs" from a computer, the SEC said. "According to O'Hara's handwritten notes ... one of them told Madoff, `I won't lie any longer. Next time, I say 'ask Frank,'" the SEC said. Frank DiPascali, Madoff's former finance chief, is cooperating after pleading guilty in August to helping Madoff carry out his fraud. 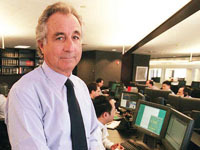 Madoff, 71, was sentenced in June to 150 years in prison for orchestrating a decades-long Ponzi scheme in which investors are paid with other investors' money rather than actual profits on their investment. The scheme destroyed thousands of people's life savings and wrecked charities. The Associated Press has contributed to the report.